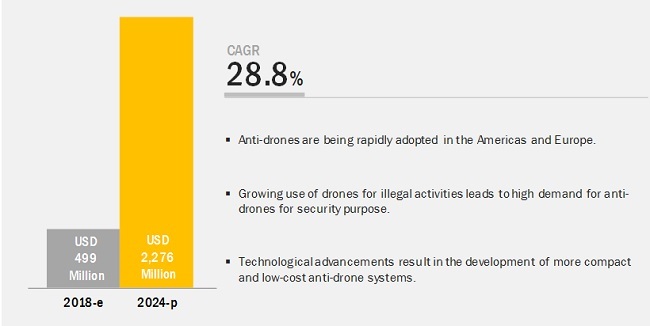 [139 Pages Report] The anti-drone market is expected to grow from USD 499 million in 2018 to USD 2,276 million by 2024, at a CAGR of 28.8%. Major factors driving the growth of this market are increasing terrorism and illicit activities across the world and rising incidences of security breaches by unidentified drones. The military & defense vertical is expected to account for the largest share of the anti-drone market during the forecast period. Presently, countries are also giving importance to strengthening counter-drone measures to monitor terrorist activities, which would boost the demand for anti-drone systems in the near future. The use of drones for border trespassing, smuggling, and spying has increased. As a result, the demand for an efficient anti-drone system is expected to rise in the coming years in the military & defense sector. The market for laser counter-drone systems is expected to grow at the highest CAGR during the forecast period. Laser systems offer great speed, significant flexibility, high precision, and low cost per shot. Therefore, they mostly find their applications in the military & defense vertical. Also, companies such as The Boeing Co. (US), Lockheed Martin Corp. (US), Rheinmetall Defense Electronics GmbH (Germany), and Raytheon Co. (US)have been developing laser-based anti-drone systems. The Americas is likely to account for a major share of the global anti-drone market in during the forecast period. The growth can also be attributed to the presence of several key players in this region, such as Airbus Defence and Space (US), Battelle Memorial Institute (US), Department 13 International Ltd. (US), DeTect, Inc. (US), and Lockheed Martin Corp. (US). Also, other factors contributing to the growth of this market include increasing terrorist attacks and rising incidences of security breaches by unidentified drones in the Americas, especially in the US. Major players in the anti-drone market include Thales Group (US), Blighter Surveillance Systems Ltd. (UK), Lockheed Martin Corp. (US), Saab AB (Sweden), Raytheon Co. (US), Dedrone (US), Israel Aerospace Industries Ltd.(Israel), Security and Counterintelligence Group (SCG) LCC (Switzerland), DroneShield Ltd. (Australia), Liteye Systems, Inc. (US), Theiss UAV Solutions, LLC (US), BSS Holland BV (Netherlands), and Prime Consulting & Technologies (Denmark). Lockheed Martin Corp. (US) is as a global security and aerospace company offering advanced technology-based systems and related services. Lockheed Martin engineers are collaborating with customers and academia to research, develop, and implement the technology that will detect and defeat drones. To grow in the anti-drone market, the company has selected a mix of organic and inorganic growth strategies such as contracts and product launches. For example, the US Army awarded Dynetics (US), Lockheed Martin, and their partners a contract worth USD 10 million to continue development on the next phase of the high-energy laser tactical vehicle demonstrator (HEL TVD) program. In September 2017, Lockheed Martin announced the release of its prototype laser weapon that incorporates an advanced system of sensors, software, and specialized optics to defeat UAV threats. In November 2018, the US Army awarded Raytheon Co. (US) a contract (worth USD 191 million) for Ku-band radio frequency radars. KuRFS, an advanced electronically scanned array system, fills an immediate US Army operational need for a C-UAV radar. Already deployed, KuRFS delivers precision fire control and "sense and warn" capability for multiple missions, including detection of the rocket, artillery, and mortar, and swarming UAS threats. In September 2018, Dedrone (US) announced the launch of DroneTracker 3.5 that detects and tracks all the drones over a protected site. It can track each drone individually from a mile away and identify the location of the pilot. DroneTracker 3.5, hosted in the cloud or on-premise, uses Dedrone’s DroneDNA database to recognize and classify RF, Wi-Fi, and autonomous drones. In September 2018, Thales Group (France), Department 13 International Ltd. (US), and EPE (Australia) signed an MOU for the integration of MESMER software into the Thales Bushmaster vehicle to produce the first robust mobile MESMER unit. MESMER is a counter drone system that provides a safe and effective method of protecting personnel and infrastructure from dangerous drones. What are the upcoming products and technologies in the anti-drone market? What are the fastest- or highest-growing segments in the anti-drone market? What are major drivers, restraints, opportunities, and challenges pertaining to the anti-drone market? 11.2.5 Blighter Surveillance Systems Ltd.
11.2.7 Israel Aerospace Industries Ltd.
11.4.1 Department 13 International Ltd. The study has involved 4 major activities in estimating the size of the anti-drone market. Exhaustive secondary research has been done to collect information on the anti-drone market and its peer market. Validation of these findings, assumptions, and sizing with industry experts across value chain through primary research has been the next step. Both top-down and bottom-up approaches have been employed to estimate the complete market size. After that, market breakdown and data triangulation have been used to estimate the market size of segments and subsegments. In the secondary research, various secondary sources have been referred to for identifying and collecting information important for this study. Secondary sources include corporate filings (such as annual reports, investor presentations, and financial statements); trade, business, and professional associations; white papers, anti-drone–related journals, and certified publications; articles from recognized authors; gold and silver standard websites; directories; and databases. Few examples of secondary sources are the Federal Aviation Administration (FAA), Federal Communications Commission (FCC), Unmanned Aerial Vehicle Systems Association, Association of the United States Army, and Royal Aeronautical Society. In the primary research, various primary sources from both the supply and demand sides have been interviewed to obtain the qualitative and quantitative information for this report. Primary sources from the supply side include industry experts such as CEOs, VPs, marketing directors, technology and innovation directors, and related key executives from major companies and organizations operating in the anti-drone market. Following is the breakdown of primary respondents. After arriving at the overall market size—using the estimation processes explained above—the market has been split into several segments and subsegments. To complete the overall market engineering process and arrive at the exact statistics of each market segment and subsegment, data triangulation and market breakdown procedures have been employed, wherever applicable. 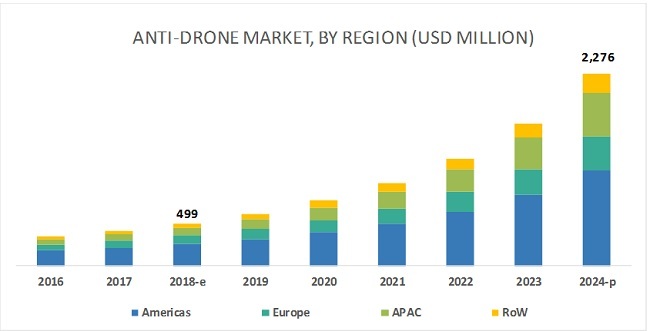 The data has been triangulated by studying various factors and trends in both demand and supply sides of the anti-drone market. Thales Group (US), Blighter Surveillance Systems Ltd. (UK), Lockheed Martin Corp. (US), Saab AB (Sweden), Raytheon Co. (US), Dedrone (US), Israel Aerospace Industries Ltd. (Israel), Security and Counterintelligence Group (SCG) LCC (Switzerland), and DroneShield Ltd. (Australia). Total 20 major players have been covered. This report categorizes the anti-drone market based on technology, application, vertical, and geography. Which are key verticals for the anti-drone market? Who all are major market players and how intense is the competition?